"Not all the fatalities were men though. A newspaper list records that on 13th September 1853, Catherine Williams, a young girl from the Clynnog area, met her death whilst visiting the Quarry when a section of the workface collapsed overtaking her and killing her on the spot. “A dreadful accident, by which one woman lost her life and another received serious injuries, has occurred in the Llanberis Slate Quarry. Three women, one a farmers daughter, and the other two farm servants, visited the Quarry to witness the operations going on. One of the quarrymen conducted them over the works. He left them standing at the extremity of the level desiring them not to go further, as some rubbish was about to be cleared from the top of the quarry. In a short time several tons weight of rock descended on the paved floor at a considerable distance from them: but a rebound took place, and the rock fell near where the women stood with great violence, and became shattered into large fragments, which flew in all directions. One of these struck one of the women in the back, inflicting a frightful wound, from which the blood flowed in a torrent. The poor creature died in a few moments and never uttered a word. Her fellow servant was thrown to the ground and received serious bruises but was not otherwise injured. 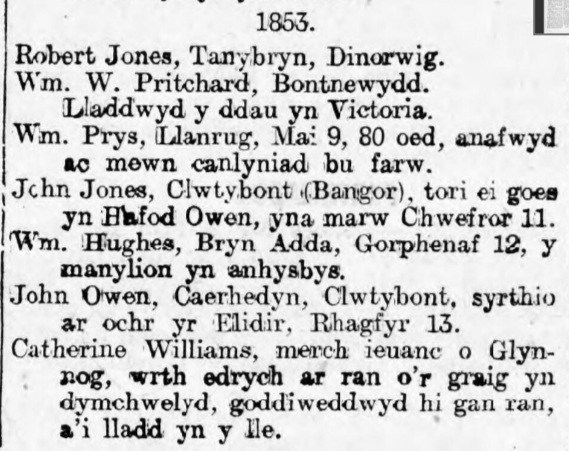 Clynnog Burial Register shows Catherine Williams, 24 years of Gyrn Goch buried 13th September."